Breathless Resorts & Spas is Ready to Welcome 2015! We would expect nothing less than a legendary night to celebrate New Year’s Eve at Breathless Punta Cana Resort & Spa. And looking at their events and activities, you will certainly be ending 2014 on a high note! Start off celebrating the Last Foam Party of 2014 at 3:30 pm at the freestyle pool. A very important experience for any Breathless escape! After you washed up and are dressed to the nines, time for our Gala dinner. Reserve a spot at any of our restaurants or buffets and enjoy gourmet offerings we’ve been waiting all year to serve! You can even reserve your choice of wine or Champagne to be waiting for you when you arrive! Stop by and book the restaurant of your choice with the concierge located at the desk outside of Spoon from 10 a.m. – 5 p.m. every day. All restaurants will have a formal dress code on this night. Our Breathless Band will be serenating you all night from our Central Plaza! The party really starts at 11:00 p.m. when we welcome DJ Mark M, known for his residency at Club Space Miami, to get everyone moving! New Year’s isn’t about just celebrating the end of the year, it’s about the start of a new one so the party doesn’t end there, we’ll be dancing under fireworks as we welcome 2015! 2015 sounds like it’s going to be a great year! 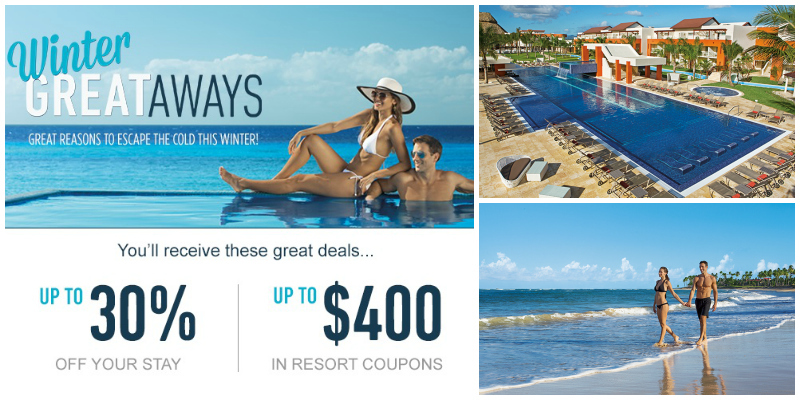 Check out our latest special offers and book your 2015 vacation today! Come January 2, the holiday season will officially be over. No matter where you live or how cold it can get there, the early months of the year tend to be gray and dark. If you’re nodding your head in agreement, Breathless Resorts & Spas officially prescribes a Winter GREATaway! 4 Travel Tuesday Tips to Help You Arrive in Style! Traveling is fun but it can be a bit tiring as well! You have counted down to your departure date, now it’s just a matter of a few hours of airline travel and you are officially on vacation! We don’t mind this view at Breathless Punta Cana Resort & Spa! In light of the cosmetic struggles of travel, our mantra is: when you look good, you feel good. That’s why we put together this list of travel tips to help you arrive in comfort and style at Breathless Punta Cana Resort & Spa! We want to help you feel as good as this photo from Breathless Punta Cana Resort & Spa fan Ivana L looks! Bring a large, refillable water bottle to the airport. Empty bottles are safe to bring through security and can be refilled at any of the airport’s water fountains! This practice will save you some cash, help the environment, and keep you feeling great for your arrival at Breathless! Staying hydrated is key to looking fresh while traveling. Once you arrive, you can put down the water bottle and grab one of these delicious Breathless Punta Cana Resort & Spa cocktails! Taking your seat in a plane jammed with passengers can be uncomfortable and expose you to germs. Bringing a tiny hand-sanitizer in your carry-on to help you alleviate the ‘yucks’ of travel. We want you to enjoy your Breathless Punta Cana Resort & Spa getaway feeling 100 percent healthy! 3. Take Your Terrific Smile On-the-Go! Two cups of coffee, airport pizza, and a bag of airplane peanuts later, it might be time to brush your teeth! Freshen up with a travel-size toothbrush and toothpaste—it’ll make a world of difference! After all, you won’t stop smiling once you get to Breathless Punta Cana Resort & Spa! 4. Maintain Your Glow, But Don’t Shine! It’s hot in the plane, and you’re packed into the middle seat like a sardine. Pick up some oil absorbing sheets to keep your face from becoming oily and shiny, and your makeup will look fabulous all day! Throw in some moisturizer, travel-sized of course, and your go-to cosmetics to freshen up and feel great. These tips will keep you comfortable and happy before you get to Breathless Punta Cana Resort & Spa! Don’t forget to throw your bathing suit and favorite outfit in your carry-on bag so you can easily find these essentials when you arrive! If you’re ready to pack your bags, check out our special offers and book today!